We are experiencing a bit of wind now and our Fort Lauderdale fishing trips are featuring some five foot waves. Not terribly rough but certainly a bit choppy. With the wind blowing out of the southeast and a north current it is more of a rolling wave condition as opposed to what would be much more steep if the current were to be into the wind. The seas are forecast to drop considerably and a small front will move in Friday and swing the wind northeast with only 2 to 3 foot seas expected over the weekend. The fishing has proven erratic with scattered Kings and an occasional Sail. Mahi-Mahi tough as well since Sunday. With the seas up as we mentioned we would have expected a bit more in the box but that is fishing and the fish do have the final say. 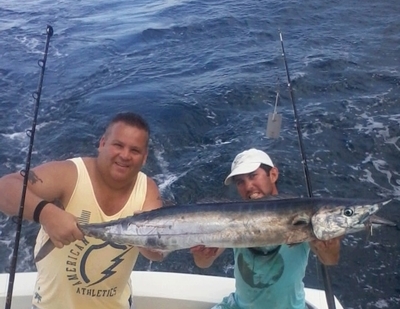 Coming off the moon now we will be angling for a nice Wahoo like the one in the photogragh. These fish will be once again best within 400 feet of water but they won’t hesitate to come up on and venture inside the reef, especially the good sized ones. We are looking forward to the weekend and the change in the weather and the ocean with the small frontal system.